A young nonprofit aims to create a coalition of local governments pushing for World War II-style commitment to address challenges of global warming. In a lead-up to the 2016 Democratic Party nomination, candidate Bernie Sanders characterized Hillary Clinton’s approach to global warming as slow and bureaucratic. Calling the Paris Agreement “a lot of paper” during a debate broadcast on CNN, he claimed that the former Secretary of State did not recognize the enormity of the challenges facing humanity. “When we look at climate change now, we have got to realize that this is a global environmental crisis of unprecedented urgency,” he demanded. Sanders, an independent who caucuses with the Democrats and ran for the Democratic nomination, isn’t the only politician drawing parallels between climate change and fascist aggression. New York Democrat Alexandria Ocasio-Cortez, who has been hailed as an up-and-coming progressive champion, has spoken about the need for a World War II-style commitment to fighting global warming. The Democratic Party in 2016 included similar language in its official platform. The injection of this messaging into American political discourse can be traced in part to The Climate Mobilization, a largely volunteer-run nonprofit founded in 2014. Executive Director Margaret Salamon Klein, pictured with colleagues, says the organization was born out of a conviction that only a narrow window of time remains to prevent widespread climate catastrophe. So what would this mobilization look like? In 2016, the group released a paper laying out its vision. After Pearl Harbor, it says, the private sector and ordinary citizens alike embraced the need for an immediate shift to wartime mode, financed by massive public spending. Soldiers flew to Europe to fight, while civilians ramped up scientific research efforts, transformed factories into military production centers, and planted Victory Gardens to supplement food rations. Translating this effort into the modern era, The Climate Mobilization advocates for nationwide initiatives to halt greenhouse gas emissions and cool the planet to safe levels. Among its policy recommendations: harnessing the Federal Reserve Board to fund emergency climate action; rationing products and services that emit greenhouse gases; and launching a massive research and development program aimed at reducing atmospheric greenhouse gas concentrations to preindustrial levels. During the 2016 campaign, The Climate Mobilization focused its efforts on influencing candidates for national office. But when Donald Trump’s victory smashed hopes of federal progress on climate, Klein Salamon and her team turned their attention to local governments. Their first collaboration with municipal officials grew out of a call from the office of Los Angeles Council Member Paul Koretz. Having seen The Climate Mobilization’s work on the presidential campaign, Koretz’s staff wanted to learn more about how these ideas could be implemented on the local level. 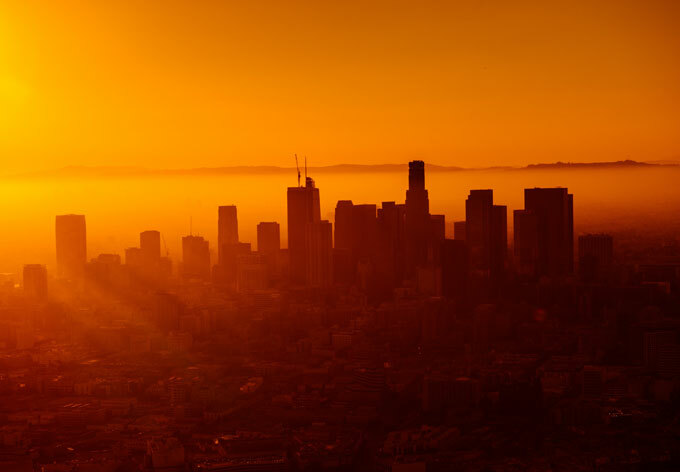 Early this year, Koretz introduced a motion to create a municipal Climate Emergency Mobilization Department; in April, the city council voted unanimously to explore the idea further. While the city ponders its next steps, The Climate Mobilization is helping to prepare a local action plan. “We’re working with leading community and environmental justice organizations from South Los Angeles to bring the plan to their communities, so it’s based in their needs and values,” said Ezra Silk, the organization’s director of strategy and policy. To help persuade other cities to buy into its ideas – and demonstrate that the dramatic emissions reductions it calls for are feasible – The Climate Mobilization prepared sample action plans for nine additional cities around the U.S. Engineer John Mitchell, who wrote the plans, pulled data about each city from publicly available sources like municipal utility reports and Google’s Project Sunroof. He then created tailored recommendations based on policies and programs that have been successfully implemented elsewhere, ranging from a municipal waste-processing initiative in Halifax to a combined electric vehicle and rooftop solar program in Japan. In the past year, The Climate Mobilization and partners and volunteers have convinced four local governments to declare climate emergencies. In California, these include Berkeley and neighboring Richmond. On the east coast, Hoboken, New Jersey, and Montgomery County, Maryland, have signed on. 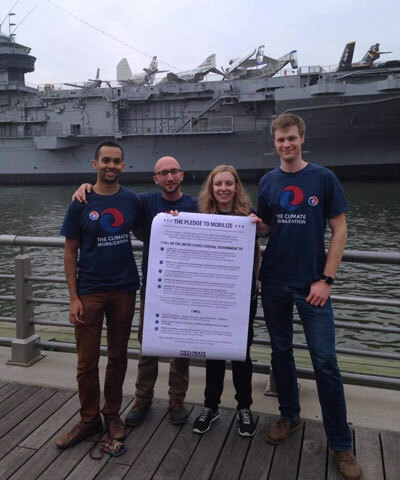 While a number of climate organizations focus on cities, The Climate Mobilization describes itself as unique in its emphasis on World War II-style measures. Its focus on using cities to put pressure on regional and national governments also stands out. While municipalities need to eliminate their own greenhouse gas emissions, their commitment must extend beyond their borders, the organization contends. Given the scale of the problem, it says, cities need to join forces to push for emergency measures at higher levels. According to Silk, Berkeley has taken this idea to heart. The local government held a town hall on August 24 to promote the idea of a wave of emergency declarations throughout the Bay Area; Los Angeles’s Paul Koretz was one of the speakers. As a follow-up, it plans to host a two-day summit early next year to galvanize action in the wider region. The Climate Mobilization’s cities strategy draws heavily on the ideas of Philip Sutton, an Australian environmentalist who leads a climate emergency movement in a small community near Melbourne. In his writing and speeches, Sutton emphasizes the need for thoughtful planning and action to accompany emergency declarations, as opposed to the purely rhetorical statements he’s seen from some cities. A better strategy, she contends, is to present all aspects of the issue as clearly as possible, making the risks of continued warming clear so that people can make informed choices. “What my psychology background has taught me is that telling the truth is at the core of change,” she said. In this line of thinking, if the only way to prevent worst-case warming scenarios is to throw all of humanity’s creativity and resources at the problem immediately, the broadest possible range of individuals needs to feel strongly motivated to act. And cities can help provide this motivation. Just how huge may well depend on how many cities – and which ones – rise to the challenge. Sarah Wesseler is a Brooklyn-based writer focusing on cities, culture, and climate change.